Francis A. Harding, Secretary, Boston, Mass, Nov. 23, 1926. 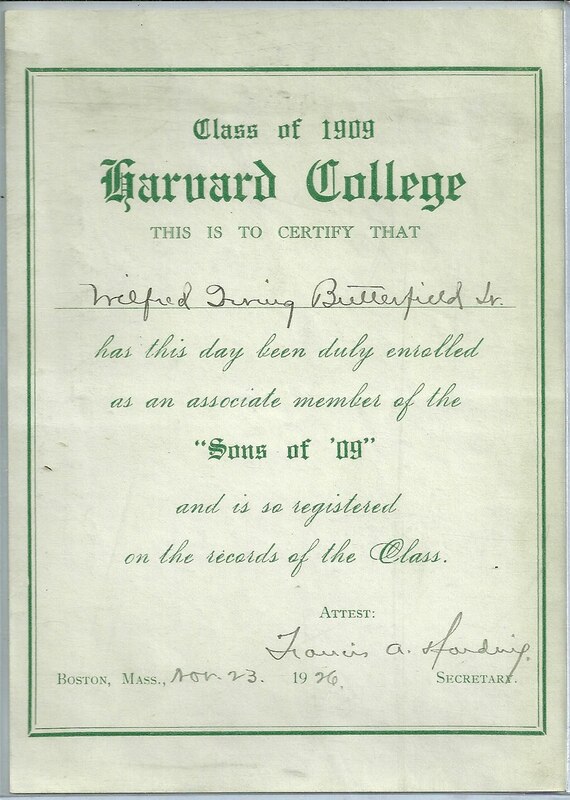 Online research shows that Wilfred Irving Butterfield was born in 1883 in Kingman, Maine, the son of Jerome and Adra Anna (Robinson) Butterfield. He married Margaret B. Ayer in 1916. She was born in 1887 in Lincoln, Maine, the daughter of Horatio S. and Mary Roxanna (Ayer) Ayer. Wilfred and Margaret had 3 children, Wilfred Irving, Jr., Jerome and Ruth. 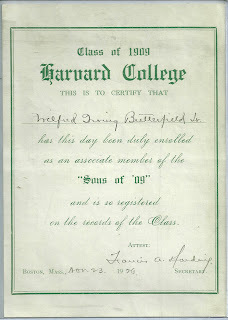 I'd love to know more about how Wilfred Irving Butterfield found his way from the woods of Maine to Harvard College. I saw a brief bio indicating he went to high school in Springfield, Maine, then Phillips Academy in Exeter, New Hampshire, and on to Harvard. He returned home after graduation from Harvard and practiced law, first in Kingman and then in Bangor. Hopefully you will find this memento meaningful - thanks for stopping by!